Creating an amazing cup of coffee relies on a number of different factors, from water type and temperature to bean quality and freshness. Although the ‘perfect’ cup of coffee will vary from person to person, everyone can agree that using freshly ground beans is one of the most important considerations to brewing the ideal cup, even for beginners. Our top pick is the premium, high-end Breville BDC650BSS Grind Control. This is the most flexible machine on our list, with the ability to brew one cup at a time, up to 12 cups. Not only that, it has the widest range of grind and strength settings that we’ve seen. We figure if you really want quality coffee, it’s worth spending a bit of extra money to make it the best possible brew. A fresh pot of coffee is as simple as the press of a button with these coffee machines. The second you grind your beans, they are exposed to air and start to oxidize – in layman’s terms, this means that they will immediately start to lose flavor, aroma and freshness as those delectable aromatic oils start to dissipate. The smaller a particle, the faster it breaks down – so tiny coffee grinds are not going to stay fresh for long (how long does coffee last?). In fact, some coffee experts claim that you must use your grinds within 30-minutes of grinding. 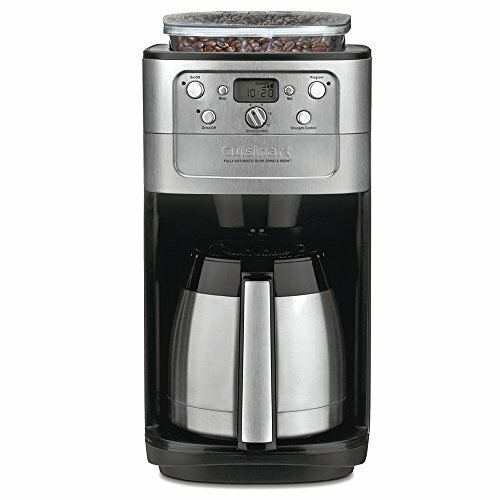 In this guide, we will search for the best grind and brew coffee maker. We will review the pros and cons of the best drip coffee makers to help you pick the best one for you. The five machines reviewed below are some of the best on the market, with a variety of different options and prices to suit any home. Why Buy A Grind And Brew Coffee Maker? The process of grinding to the right size, figuring out the measurements, brewing times and putting it all together is time consuming – not a routine many people are willing to go through every morning. Purchasing a coffee maker with grinder included saves you from that rigmarole – you get all the joy of the freshest possible coffee and the convenience of a machine that figures out the details. All you have to do is a little tweaking to figure out your ideal settings and then it’s fresh coffee all day every day – if that’s what you desire! Your coffee grind will always be super fresh, meaning your cup of coffee will have the optimum flavor and aroma. If you’re somebody who is fussy about drinking quality coffee, such as the best Kona coffee, but lack the time or patience to measure, grind and brew in separate stages, a grind and brew machine will suit you perfectly. You won’t waste time in the morning fussing around, instead waking up to delicious, fresh coffee, brewed to your specifications. Some people, however, love the scientific routine of crafting their own coffee from scratch. If you prefer having the utmost control of every aspect of the coffee-making process, you will more likely prefer a separate grinder and brewer of your choice – with endless options for customization and precision. Burr grinders are more expensive than blade grinders, but this is because they produce far better grind quality. With a burr grinder, the grinds will be more evenly sized, and there is less heat produced in the grinding process, meaning your coffee retains more aroma and flavor. If you’re going to invest money in a grinder/brewer combo, we recommend spending a little extra to ensure you purchase one with a burr grinder. A single person household will obviously cope better with a smaller volume of coffee produced than a busy office, for instance. Are you someone who only drinks one or two cups of coffee in the morning or a large family who want to drink throughout the day? Check the capacity of your machine to make sure it can produce enough coffee for your requirements. Also take into consideration the capacity of the bean hopper. Most models reviewed here will hold a large amount of beans and grind only what is needed for each brew, however some machines will have to be refilled every time. There’s no use buying a fancy machine with all the bells and whistles if it’s going to take up half your counter space. Make sure you figure out where you want to keep your appliance before you start shopping, and buy something compact enough to fit under shelves or pop into a corner as needed. If you prefer to have a little more control over the outcome of your coffee, you’ll want to look for a machine with a larger number of grind and strength settings, like the Breville BDC650BSS Grind Control. Do you want a glass carafe that will need a hot plate to keep the coffee warm, or a thermal carafe that maintains heat without electricity? A thermal carafe will keep coffee hot for a few hours without compromising on flavor, but may not be as piping hot as coffee that sits on a hotplate. One of the main reasons for buying a grind and brew machine is to save time on prep, so you probably don’t want to spend those extra minutes on finicky cleaning. 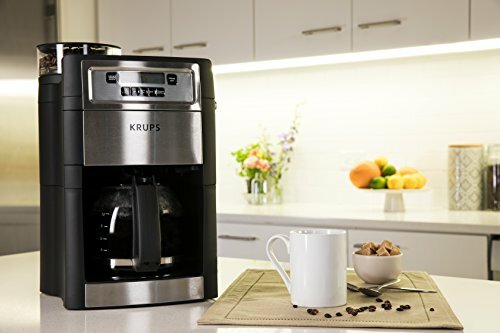 If you are short on time and don’t have the patience for intricate cleaning, buy a model like the Krups Automatic Coffee Maker below. Grinding beans will always create a bit of noise. If you are an early riser in a house full of people who like to sleep in, look out for something that isn’t going to wake up the whole household. We recommend the Black + Decker 12-cup mill with it’s quiet grinding process. 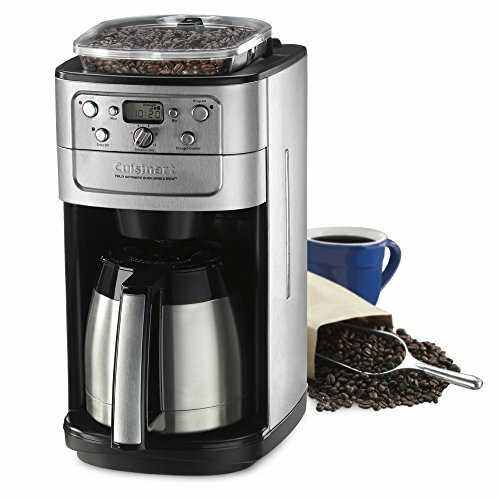 The Cuisinart Grind & Brew coffee maker proves that you don’t have to look fancy to produce quality goods! The simple design and operation bely the fact that this machine has ample options and settings that you can customize to your liking. We love the thermal carafe – designed to keep your coffee warmer for longer, right down to the last cup – this jug really does keep your coffee hot enough to drink for hours without using electricity. The included burr grinder can be set to grind enough coffee for 2-12 cups, and you can set the strength selector to strong, medium, or mild, depending on how much kick you like from your coffee. If you’re too impatient to wait until the end of the brew – you can tap the brew pause button and pour yourself a cup mid-brew. If you have some quality pre-ground beans you want to try out, you can hit the grind off button and brew from those instead of using whole beans. See our best grocery store coffee guide for our favorite picks when in a pinch. This unit is so easy to use: simply add water, beans (or grounds if you prefer), select the number of cups you want, choose the strength and voila, your machine will get to work grinding and brewing. Or set it up the night before and wake up to freshly brewed, delicious coffee. There are some niggling design flaws with this appliance. When pouring the last few cups of coffee from the carafe, you have to almost turn it fully upside down, due to the large lip at the top of the pot. Whole beans often get stuck in the chute between the hopper and grinder and have to be fished out, and the grinds can clog up regularly, requiring extra cleaning. Some people have problems with pouring – finding coffee drips and spills from the carafe for the first few cups. It may take you a bit of experimentation and tweaking to perfect your cup of coffee, but once you have it figured out, the results should be pleasing every time. The Cuisinart DGB 900-BC is a compact machine that won’t take up too much counter space. If you’re after a coffee maker with the ability to have your coffee ready to go in the morning, and are willing to spend a bit of time figuring out the controls to get it right for your tastes, give this one a go. This Krups drip coffee maker has a sleek, modern design. Simple and stylish, it should match well to any kitchen décor. The LCD display is easy to read and the push button controls simple to understand and operate. The glass carafe sits on a hot plate which can be programmed to keep your coffee piping hot for up to two hours before the safety shut-off kicks in. Both the temperature of the hot plate and the time it operates for is adjustable. One of the best things about this machine is that it is super easy to clean, unlike many similar models – simply remove the coffee filter, empty the grounds, rinse and put back in. It’s possible to use either whole beans or grinds, and there’s the good old brew pause feature too. If you prefer your coffee rich and strong, you may not be happy with this model – even on “fine” setting, the grinds aren’t as fine as some people would like in order to get that perfect extraction for stronger coffee. Note that although the machine only grinds the amount of beans required for your programmed coffee, it does use all the water you put into the tank, regardless of how many cups you have asked it to produce. At 10-cup capacity, it may be a little small for larger families or shared working spaces. Ideal for someone looking for grinder/brewer combo that is simple to operate and clean, this Krups model covers all the basics and does produce great tasting coffee, if not a little weak for some tastes. Note: The instruction manual leaves out an important step in the process for using pre-ground coffee. After you put in the water and ground coffee, make sure the LED screen is live (glowing blue) by pushing any button. Push the “grind off” button once, then press the “grind/brew” switch once. The process is the same for the initial cleansing brew – minus the coffee grinds! This is the most affordable model on our top five list. Although it may not be as fancy looking as the other machines, the control buttons on this coffee maker are clearly marked and very easy to read and use. The Black & Decker CEM 5000B Mill & Brew presents some excellent features and tremendous value. One of its best-selling points is its all-in-one grinder/filter system. The beans are ground and filtered in one place without having to be transferred to the drip basket via a chute. This reduces the chances for clogging and jamming and makes cleaning very easy. There are some key differences between this more budget model and the others on our list. Firstly, the grinder and filter have been combined so they are one piece – this makes cleaning super easy and fast. 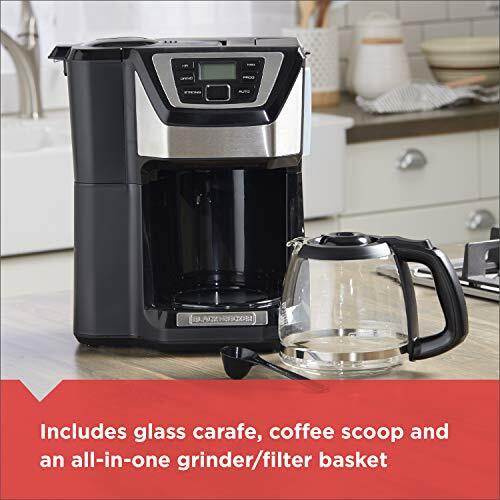 Features it has in common with the other machines are the “sneak-a-cup” option – the same as brew pause on other models; you can choose between whole beans or pre-ground coffee, and there is a 24-hour programmable option for automating your morning coffee drinking. In this machine, the bean hopper only takes the required beans for each brew – as opposed to the other models where you can fill it up with beans and it uses only as many as required, storing the rest for later. The grinder is not a burr grinder – although it’s much quieter to operate than many similar models, blade grinders do not produce such an even grind. Design wise, it’s quite a tall unit, so if you’re hoping to fit it underneath some cabinets, make sure you check the measurements first. There is no notifying “beep” when the brewing cycle is complete or the heating plate turns off – a bonus for some people who find the beep annoying, or a feature that will be missed for those that appreciate the heads-up. When it comes to coffee – there is no doubt that this machine has the capability to make a rich, dark brew with consistent results. There have been issues with longevity of this machine and break downs after only a few months of use, mainly related to leaking and excess steam. Bear in mind that this machine is around half the price of our other listings and you get what you pay for. This top end Breville grind and brew coffee maker has a number of features that set it apart from the other top machines listed, with a lot more flexibility designed into it. This is the only model reviewed here that has a single cup option. In fact, the volume is highly programmable – you can brew anything from 8-ounces of coffee to 12 cups. Not only that, but you’re not limited to using the carafe that comes with the machine. You can use any travel mug, your favorite coffee mug, or whatever receptacle you prefer; the drip tray is removable so you can fit taller cups in. This machine is smart enough to know exactly how much water it needs to use from the tank, and only uses the right amount. Other machines on our list use all the water in the tank regardless of programmed settings. The burr grinder has an impressive six different grind settings. Whereas most machines here have only three strength settings – the Breville Grind Control has eight – with number four being the setting for medium strength coffee. There are the usual features too, such as the ability to use pre-ground coffee or brew pause. The carafe is thermal and will keep your coffee hot for 2-3 hours and warm for many more without compromising on flavor with continual heating. For the price-tag, you’d expect a high-quality machine, and you do get it – overall. As with any appliance, there are some flaws that may annoy users. The carafe provided is extremely difficult to get the last drops of liquid from – you have to turn it all the way upside down. Cleaning can be a drag – it needs almost daily rinsing, and the vertical coffee grounds chute can be tricky to clean. You may have some issues with the grinder – it appears it can become jammed quite frequently and you might have to be on standby to monitor and push the beans through during the grinding process. The Breville grind and brew coffee maker is a high-end machine with notable improvements and more flexibility than the other models. Great for those looking for the single cup option lacking in other coffee makers as seen in our Keurig reviews. If you want a bit more control over your final brew, with extra brew and grind settings, this is a great pick. However, if finicky cleaning is a deal breaker for you, best to go for something that requires a bit less maintenance. The Capresso 464.05 (a.k.a. CoffeeTeam GS) has an impressive number of features and is really a fine-looking machine. It’s conical, stainless steel burr grinder is situated to the rear of the unit. It grinds the beans quickly and efficiently and delivers them directly to their best coffee filter with no intervening chute. With a minimum of two cups, maximum of ten cups and three strength settings to choose from, this Capresso machine is be pretty standard in those regards. For those with very little kitchen space, it has a compact design with a small footprint and should be able to fit under cabinets. This appliance has a heating element to keep coffee piping hot for two hours, before the safety shut off kicks in. As with most of our top grinders and brewers, there is the option to use grinds instead of whole beans. You can store six-ounces of beans in the hopper, and the machine will use only the amount required for your settings. It will, however, use all the water from the tank. There are six grind settings to choose from, giving you a good range of options, along with the standard three strength settings. 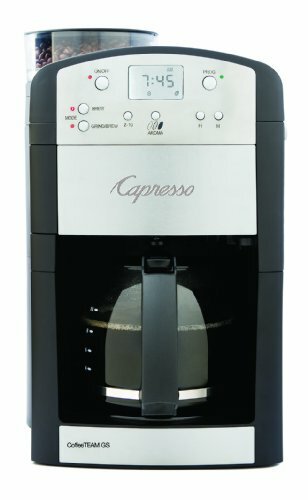 Along with all this, the Capresso 464.05 has a unique “aroma” setting. This setting is for selecting what color bean you are using. A darker bean will have a 10 aroma setting and a lighter bean around 2. The lower the number, the shorter the grind time. Cleaning is remarkably easy in this Capresso model, simply remove and rinse the carafe and basket as needed. We find the grinding process is a little noisier than the other models, and the bean capacity is smaller than other models reviewed here. If you’re a regular or heavy coffee drinker, you’ll probably be filling it every day. The Capresso 464.06 coffee maker makes a very good cup of coffee despite the build quality of the unit. It works well with oily, dark beans, as opposed to some of the other models which struggle and get clogged. A great choice without breaking the bank. When you purchase a coffee maker with built-in grinder, you’ll adore waking up to the mouth-watering aroma of freshly brewed coffee. All the machines reviewed here should have your needs covered, with a variety of programmable options, automation and safety features. 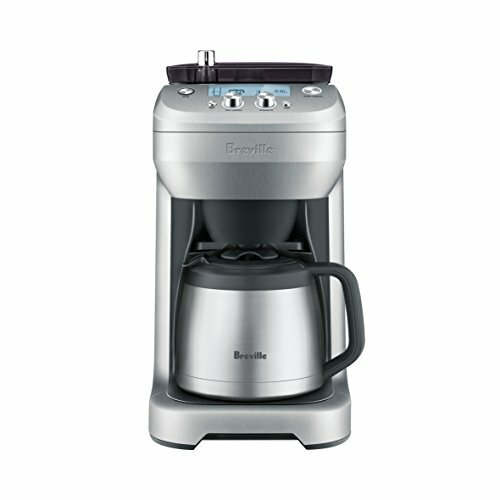 But, if we had to choose just one machine it would be the Breville BDC650BSS Grind Control. If you’re moving away from using pre-ground coffee, you will appreciate the brighter, richer taste produced from using beans that are freshly ground – your brew will be more aromatic and flavorsome, with very little effort on your part.